In late 2014 I wrote three science fiction novels set in space in a row, then there was a sudden hairpin curve: I had to go directly into a cozy mystery set in contemporary America. That’s quite a sharp turn, but if I were a car, I’d be a Volvo. I’m made for a smooth, comfortable ride and good safety ratings, not to corner on a dime. I was deeply in the science fiction mindset, and I’d have preferred to just write a few more space books – but I had to shift gears on the spot. Coming off one book and going right into another in a different genre means getting comfortable with a new story, new characters, a new setting, and sometimes a new voice – not always an easy thing to do quickly. 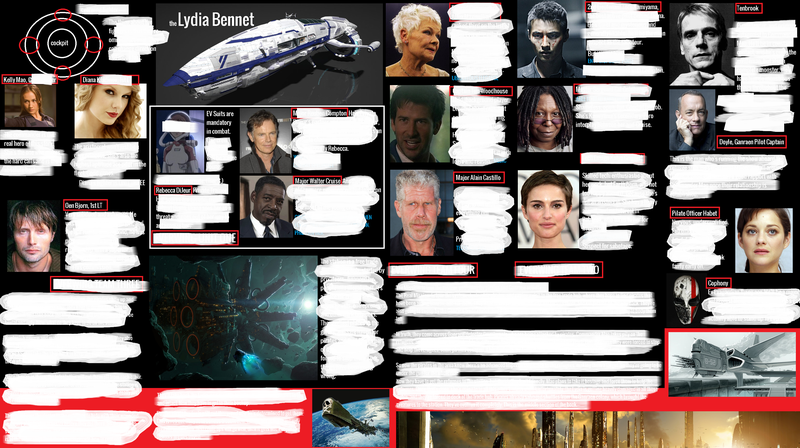 It’s a bit redacted because of the all the spoilers. But you get the idea. I call this a spread, and it serves several purposes. Putting faces on my characters helps me get to know them faster, and even just a little imagery of my setting brings me into it, and makes the people and the places seem more immediate in my mind – less like ideas, and more like things that are actually there. More than just helping familiarize me with the new, doing this helps get me away from whatever I was working on before – I don’t want aliens or dragons on my mind when I’m writing about a bed and breakfast in central Oregon. A spread doesn’t have to be pretty, and of course there aren’t any hard and fast rules for what it has to include – sometimes I’ve got the whole book outlined in it, and sometimes it’s really just the cast and their faces. A spread is a place for any information that you might find useful; I once wrote on one in big, bold letters: “The theme is forgiveness. Don’t get carried away.” And that was a constant reminder as I worked my way through that initial draft. If I’ve just finished a book with a massive cast of characters, and my next one also has a massive cast of characters – and of course I’m haunted at all times by the casts of dozens of novels past – that can make for a lot of people to keep track of. But when I’m in a first draft, the only cast that matters is the one that I’m currently writing – so a good spread can be a very useful quick reference tool if I ever start to lose track. Laying things out visually can help with cast balance and story structure, because you can look at your lineup and scenario from a different perspective than you would in a word document, and that can let you see patterns or tendencies you have that you might not have noticed in your work. You might discover that too much of your cast is improbably attractive, not diverse enough, or that you’ve inadvertently developed a penchant for setting climactic action scenes in churches in the rain – all problems I have, and routinely ignore. But at least I know I have them, and I might not otherwise. Obviously this isn’t going to be useful for everyone, but it can be fun, even therapeutic to do. I like to do my own art, or if there’s no time, at least outsource it – but if that’s not an option, there’s always your favorite celebrities to lend faces to your characters if you don’t already have something in mind. My regulars seem to be Ron Perlman, Mads Mikkelsen, and Adrien Brody. I think I’ve cast Adrien Brody in about 90% of my books. I know what you’re thinking, and you’re right. It’s also a lot of fun to look through old spreads for books you did in the past, and compare the initial blueprint to what you actually ended up writing. Also to occasionally ask yourself what on earth you were thinking, and if you shouldn’t find another career. If you’re having trouble shaking off one world in favor of the one you’re planning to write next, it might be worthwhile to try something like this – I know it helps me. Sometimes I’ll even set a spread as my desktop wallpaper so I don’t lose sight of where my head needs to be. And I’d completely forgotten that I cast Taylor Swift in Glory, and Kristin Stewart in LCI.